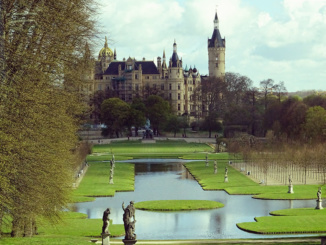 Today we took the A Tale of Two Cities – Hamburg Schwerin and a Fairytale Castle tour and promptly left the Port of Hamburg by bus at 8:45am. 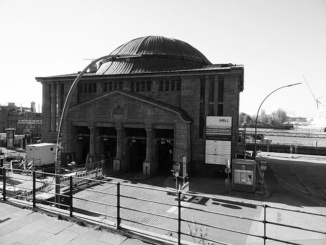 We started in West Hamburg along the Elbe River 80 miles from the North Sea. The Regal Princess was also in port sharing the same dry dock as had the German battleship Bismarck in 1936. After the dry dock area, we passed the St. Pauli Elbe Tunnel which connects workers and pedestrians with the shipyard on the other side of the Elbe River. What makes the tunnel unique is that cars and pedestrians both must use an elevator to get down to the road at each end of the tunnel. Originally built in 1911, it is a technological marvel. As we continued our way out of the city we drove along the new tide protection walls that were under construction. This is certain to change the landscape of Hamburg once completed. 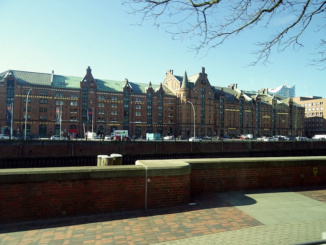 Next we passed into East Hamburg and the Speicherstadt (brick warehouse district) where construction began between 1880 and 1890. East Hamburg is the war-torn part of city where many bombs exploded and devastated the buildings and landscape. 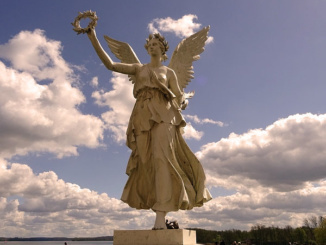 Schwerin (Cher-Ween), our destination, was not affected by the war as there was no fighting in that region. There is an 85 percent tax on gasoline in Germany and no speed limits on the motorways. 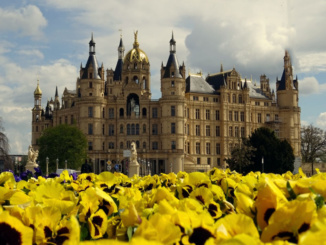 We arrived in the capital city of Schwerin in the federal state of Mecklenburg, Pomerania at 10:50am. 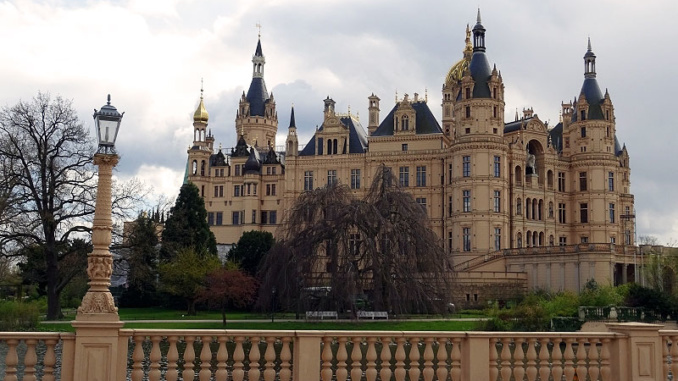 The fairy tale Schwerin Palace was very picturesque so cameras were snapping away before we could get off the bus. 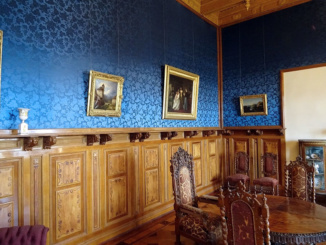 Parts of Schwerin Palace date back only 160 years. 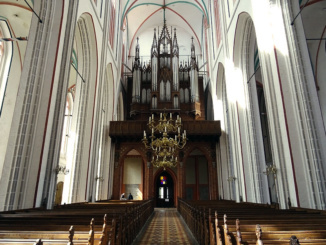 Other parts of the landmark are over 500 years old dating as far back as the renaissance. The palace itself is comprised of five distinct wings and was built on the remaining foundation of an existing Slavic fortress that is actually on a small island. We took the standard tour consisting of the majority of rooms that were in use during the 1920’s. 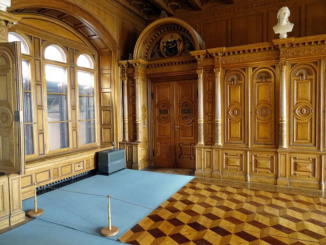 Other tours of the Palace show areas such as the hunting and jousting weaponry rooms, and the palace dungeon. 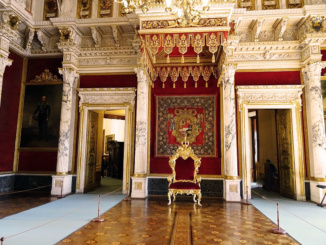 Each area we viewed was exquisite and in pristine condition with the most lavish being the Throne Room. 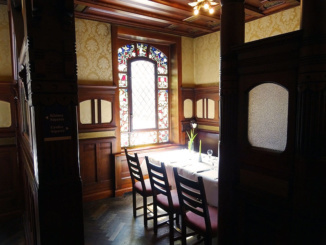 The Dining Room was also very ornate with its unique wood tiled floor. Ironically, we saw a unique collection of Delft Blue pottery here (see Delft the Hague & Madurodam Tour). 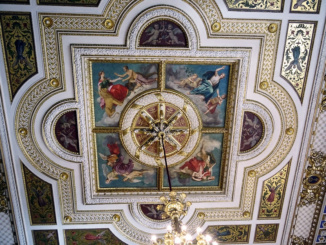 Over the years the Palace has had many uses from a Church, a Parliament, to its current state as a Museum. After the palace visit we took a nice walk through the center of Schwerin to the market square. Along the way we passed St. Nicholas’ Church, one of the oldest churches of the Hanseatic city of Stralsund dedicated in 1279. 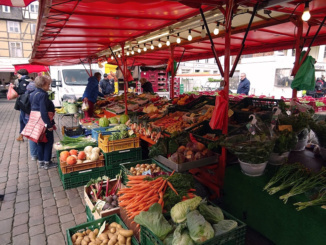 At the market square were many street vendors selling items such as fish, meat, cheese, and flowers to the public. 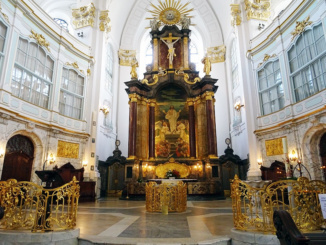 Here we entered the Schwerin Cathedral of St. Mary’s and St John’s for a few photos. 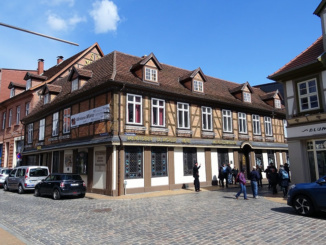 We continued through the square to lunch at Weinhaus Wöhler. The wood laden restaurant served an appetizer of tomato soup with bread, followed by chicken, potatoes and carrots. For dessert we were treated to French Vanilla Ice Cream with Strawberries. Beer, wine, soda, coffee, or black tea were also available. Our departure from Schwerin was at 2:45pm. On arrival back in Hamburg at 4:05pm we took the scenic route back to the pier weaving up and about the many streets of the city. 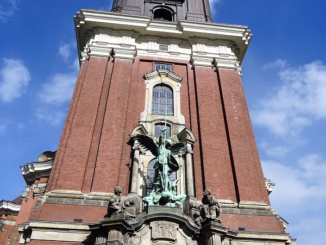 We stopped briefly at St. Michael’s Church which is Hamburg’s most famous church whose copper clad spire can be seen from the port. 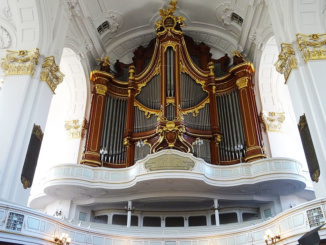 The church can hold services for 2500 people, has 5 organs (one of which contains 6,674 pipes), and has a tower that holds the largest clock in Germany. During our tour we learned some interesting facts about like there are 2,500 Linden trees scattered about the City and that Britain ruled the city after WWII. However the neatest fact that we were told is that people from Hamburg refer to themselves as Hamburgers. I liked that one! Then after a quick pass of the famous St. Pauli Red Light District we were returned to the pier at 6:10pm.